An ear-piercing alarm should ring the moment a politician pretends national security is too important for party politicking. You know they’re lying. That’s because within seconds they’ll set about violating their own injunction. Thin, grasping, avaricious fingers reach out from beneath the purity of the policy wrapping. They’re clutching around for any scrap of partisan political advantage they can use to belabour their opponents. Before the campaign began Kevin Rudd flew to Afghanistan  to thank the troops. That was terrific and appropriate. Nor should Tony Abbott be prevented from demonstrating his own personal battle-fitness by doing push-ups with the troops. These are the sorts of anodyne images you expect during election campaigns. Last week was different. For the first three weeks of the election campaign a deafening silence had enveloped strategic issues. But then, quite suddenly, the military was all anyone wanted to talk about. A deliberate, systematic attempt was being made to use national security for partisan political advantage. The issues laid on the table—the place to site Fleet Base East and the proportion of GDP to be devoted to defence—are important and need to be addressed. There’s nothing wrong either with politicians loudly asserting their points-of-view. In fact, it’s probably very good if they disagree, because the result should be better policy. In this case, however, there was no desire to improve strategic outcomes. They were irrelevant. Defence was being harnessed to serve a blatant political need: winning votes. The campaign itself had been going nowhere. Gradually, week by week and opinion poll by opinion poll, Labor had been falling behind. Rudd urgently needed to land a couple of punches on Abbott. Politically the answer was obvious. Talk about (a) the future and (b) an area where the Prime Minister’s credibility trumped that of the Opposition Leader. An announcement that the Fleet Base would move north served his needs brilliantly. The sandstone facade of the Lowy Institute added gravitas and credibility  to the move, then it was off down to the Domain for the pictures of the PM with Garden Island in the background. But that’s where it all began falling apart. Premier Barry O’Farrell heard what Rudd was doing. In a moment of brilliance he decided to ambush the press conference. The television cameras were still rolling when the NSW leader walked past, delivering a supposedly off-the-cuff comment. ‘A phone call would have been nice, Kevin’, he exclaimed, before quickly walking off and leaving the PM with his mouth gaping open. By now the strategists had also began reacting—and none were positive. It’s difficult to disagree with a Prime Minister when he’s standing in front of you, but even at Lowy the chorus of support had been muted. Rudd’s team had failed to ensure a couple of experts had been fully briefed beforehand, so they could chorus their support. There were no third-party endorsements and, instead, the critics jumped onto the airwaves to begin enumerating the problems. That night the image of the confrontation with O’Farrell dominated the reporting. Rudd’s only supporter was someone from the cruise-liner industry talking about the need to berth tourist ships in the Navy yards. Instead of emphasising his national security credentials, the move had backfired. It’s dangerous to suggest there’s such a thing as political ‘momentum’. Nevertheless, this was the moment Labor’s campaign came to a crashing halt. The campaign narrative had changed. The PM had been discomfited dealing with subject matter that should have been his strong suit. The irony was that the announcement left Labor flailing on the very day it had an opportunity to focus in on an Abbott policy that exposed his vulnerability. The previous day the coalition had laid out its budget spending commitments. The headliners were huge boosts to health and defence; an additional $40 billion worth of outlays. Critically, Abbott had specifically guaranteed defence spending would return to 2% of GDP. This should have been Labor’s ‘gotcha!’ moment. Commitments like this sound wonderful, but ASPI’s Mark Thomson quickly dissected exactly what it would mean. A week earlier he and the Institute’s Andrew Davies had measured the distance between future capability plans and current spending , so they were ready. As they quickly demonstrated, the only problem with these grand commitments is turning them into reality—requiring an annual spending boost of more than 5% for a decade . Anyone can promise to increase the budget allocation to defence. The real question is, where will that money come from? Particularly when it’s put alongside other, similar guarantees that the government will return a surplus of 1% within a decade while simultaneously managing to increase spending on health and fund an enormous new disability care scheme. This implies an economic growth rate of 17%. If you believe this can be achieved, well, I’ve got a bridge over Sydney Harbour that I’d like to sell you. Carl von Clausewitz’s great revelation was that war represents ‘the continuation of politics by other means’. In the hands of Australian politicians defence is simply another arena to continue searching for partisan advantage. Nic Stuart is a columnist with the Canberra Times. Image courtesy of Defence . 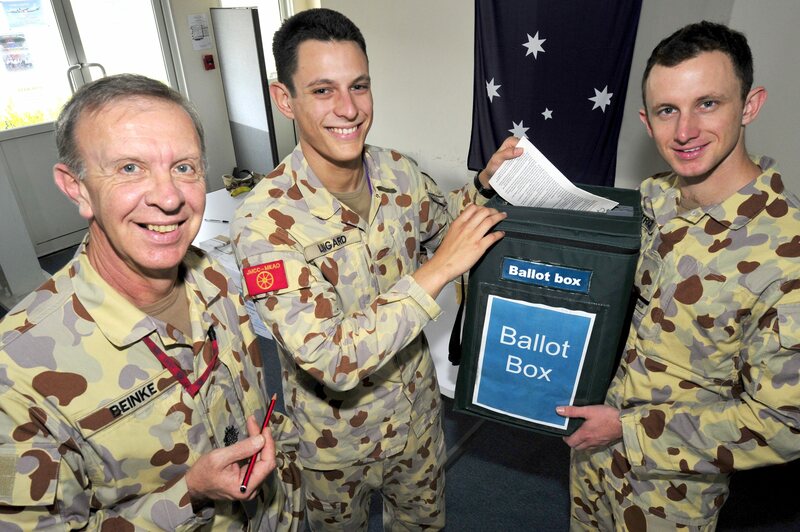 Defence: https://www.aspistrategist.org.auAustralian service personnel vote while on Operation Slipper in Afghanistan.